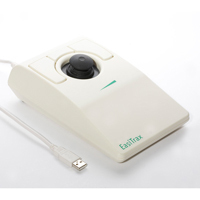 The EasiTrax is the latest addition to the Traxsys range of assistive technology devices. 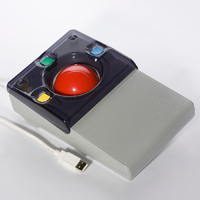 This device incorporates proven joystick cursor control together with useful functions such as cursor speed control and scroll (like a cursorpoint device, but much more functional). 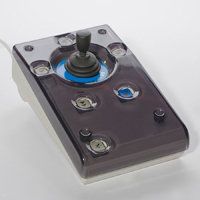 Fingertip operation of the soft joystick handle gives accurate positioning, and left and right mouse button functions, together with speed control and scroll are easily accessed using the ergonomically placed large keys. This product is ideal for anyone who prefers to use a joystick instead of a mouse. Note: Due to supply issues access to this product is severely limited. 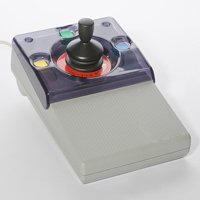 This is the deluxe version of the Trackball Roller II, and has 3 additional buttons on the unit; a Double Click button, a Speed Control (acceleration) button, and an X-Axis / Y-Axis Lockout button (to limit the movement to only the X or Y Axis if needed). This is truly the ultimate assistive trackball on the market today. 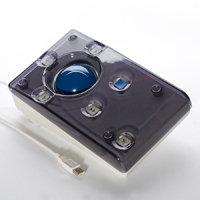 This mouse alternative is ideal for users with severe motor-skill difficulties.